Want to be notified of new releases in D2KLab/sentime? SentiME is an ensemble system consisted by five individual sub-classifiers. With the red color it has been illustrated the training process. With the blue it has been illustrated the test process. SentiME system is a system created in order to classify sentences in natural language. SentiME classifies tweets and Amazon reviews given in standard format. The training of the system is done by the first 4 sub-classifiers. Each one of them classifies each sentence separately and the final classification result is computed by the average of confident scores for each one of the classes. The class with the bigger average score is the dominant. Also during the training process we aplly bagging (Bootsrap Aggregating Algorithm) of 150% of the initial dataset. The test of the system is been done by all of the classifiers. We use the 5th (Stanford Sentiment System) sub-classifier with pre-trained models. 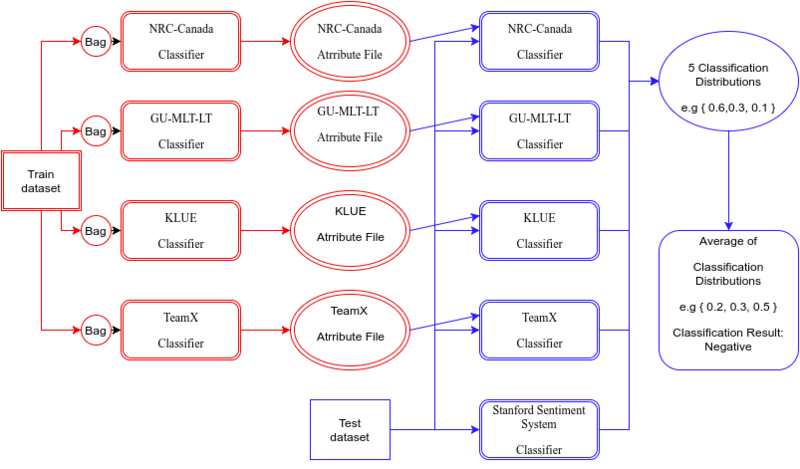 -testmodel	Only test one sub-classifier, use 0-4 to specify which sub-classifier to be tested. Use 5 to test only the original Stanford Sentiment System. -bsize	Enables bagging training process and specify the size of bootstrap samples. -disablefilter	Disable the default filter mechanism: using to disable duplicate input tweets; using to disable duplicate tweet filtering when scoring. If you don't explicitly specify the path of system parameter file, the default system parameter files will be used. All the wrong classifications will be generated in output/SentiMEa/ with a filename ending with "WrongClassified.tsv"
Sygkounas E., Rizzo G., Troncy R. (2016) A Replication Study of the Top Performing Systems in SemEval Twitter Sentiment Analysis. In: 15th International Semantic Web Conference (ISWC'16), resources Track, Kobe, Japan. Sygkounas E., Rizzo G., Troncy R. (2016) Sentiment Polarity Detection From Amazon Reviews: An Experimental Study. In: 13th Extended Semantic Web Conference (ESWC'16), Challenges Track, Heraklion, Greece. Sygkounas E., Rizzo G., Troncy R. (2016) The SentiME System at the SSA Challenge. In: (ESWC'16), Challenge on Fine-Grained Sentiment Analysis, Heraklion, Greece. 1st ranked system.